GENEVA, June 18, 2014 – Dissidents from Cuba and Venezuela testified at a UN panel yesterday about being subjected to arbitrary arrest, torture and other human rights abuses, sparking shouts and accusations from delegates of both governments, who sat in the corner of a packed Geneva hall huddled with allied delegates from Syria, North Korea and other dictatorships. However, U.S. Ambassador Keith Harper delivered strong remarks (see below) in support of human rights protection in both countries. “We were afraid to come here today,” said 33-year-old Alejandro Suarez Teppa, a Venezuelan philosophy student and protest camp leader who was arrested and brutally detained last month. He was joined on the podium by Eusebio Costa, 22, also a student protest leader from Caracas. Also, an outdoor rally to honor the young activists was held in front of the UNHRC after the panel. Click here for photo album; selected hi-res photos here. 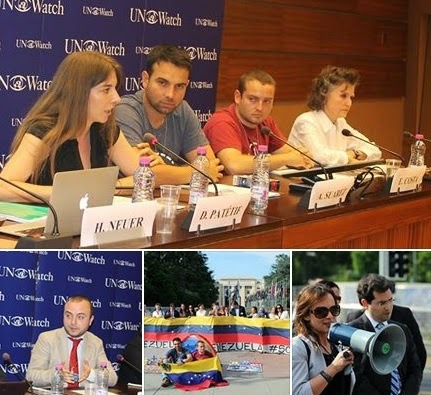 Invited by the non-governmental human rights group UN Watch, which organized yesterday’s panel at the UN Human Rights Council in Geneva as well as a press conference today, both students made the journey in defiance of a televised attack against them by powerful National Assembly President Diosdado Cabello. 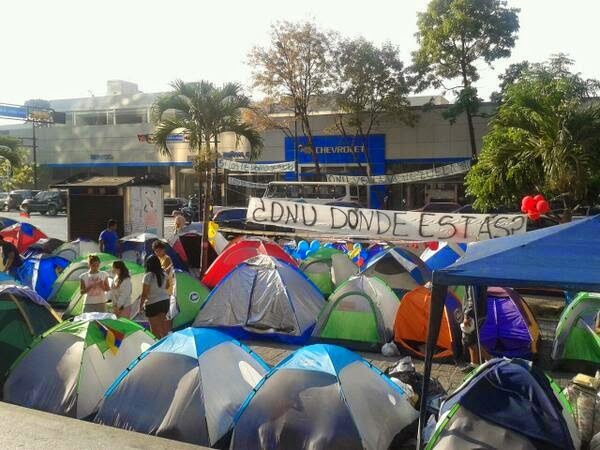 Addressing the outdoor rally, Neuer echoed the banner of the students' Caracas protest camp (see above), asking "ONU, donde estas" -- "UN, where are you?" ""We came to Geneva to ask the U.N. to send a mission to Venezuela to evaluate the cases of human rights violations that students have been subjected to." "Thirty-two people were murdered while protesting; I hope that the United Nations will not remain indifferent to violations in Venezuela." Alejandro Suarez Teppa – activist and philosophy student; National Board Member of the United Active Youth of Venezuela (Juventud Activa Venezuela Unida), and leader of protest camp in Santa Fé. He recalled witnessing students being shot in February and said his student camp was attacked on the night of May 8: "They put drugs and weapons inside the camps and U.S. dollars to indicate we were financed by foreign powers," he told reporters, saying he was beaten then held in isolation for 72 hours." "We urge the United Nations to investigate the abuses." "My nephew [Leopoldo Lopez] has been imprisoned for speaking on behalf of an ill-treated nation. 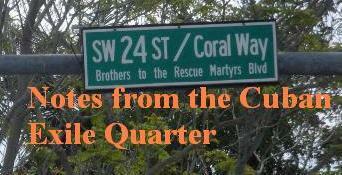 He was put in solitary confinement in harsh conditions for promoting peaceful protest." Tweet: "Cuba [is] trying to stifle dissent at the UN, just as it does at home."